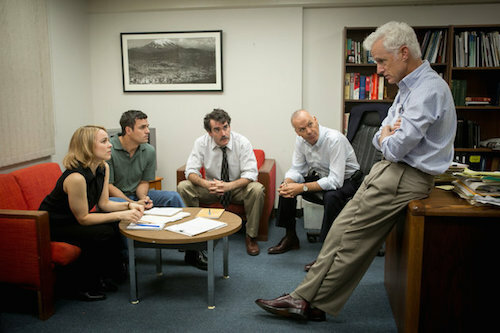 Set in Boston in the early 2000s, Spotlight is named after the four-person team of Boston Globe reporters who uncovered the massive sexual abuse scandal in the Catholic Church. The movie is the true account of their investigation. Led by Walter ‘Robby’ Robinson (Birdman‘s Michael Keaton), the team of Mike Rezendes (Mark Ruffalo from Infinitely Polar Bear), Sacha Pfeiffer (Aloha‘s Rachel McAdams), and Matt Carroll (Brian d’Arcy James from Time Out of Mind) digs into allegations of child molestation in the church, thinking that it’s only a handful of isolated incidents. With the encouragement of their editor, Marty Baron (Liev Schreiber from “Ray Donovan”), the team discovers that the problem is much bigger than just a few priests with wandering hands; not only is there a huge epidemic of sexual assault, but the church itself has been covering it up for more than thirty years. Spotlight was directed by Tom McCarthy (The Visitor) from a script written by him and Josh Singer (The Fifth Estate). It’s a surprisingly tense and suspenseful movie, considering it’s mostly made up of dialogue, but then again, reporters and priests are hardly your average action heroes and villains. The film unfolds deliberately like a mystery, with the Spotlight team working every angle to get to the bottom of the disturbing and controversial story. The twists and turns in their research combined with the unexpected obstacles which they encounter make Spotlight one hell of an engaging ride. There’s a lot of lawyering and reportering that goes on in Spotlight. That’s not a bad thing. The paper pushing and library researching that the team does is basically akin to a film noir gumshoe pounding the pavement to solve a case; that’s the attitude that the Spotlight reporters have towards their story, and that’s why a film full of depositions, interviews, and cross-examinations is so damn engrossing. Spotlight accomplishes the Herculean task of dealing with a very sensitive and troubling issue without exploiting it for viewership’s sake. Sure, the investigation makes the Catholic Archdiocese of Boston look bad, but the situation at the time was, in fact, very bad, and Spotlight has the same air of impartiality as an actual news program would have, even though it’s a fictionalized account. One does not get the feeling that dramatic license was taken to add entertainment value to the film – there’s no Argo-like car chase scene at the climax – so the film has a distinct lack of Hollywood gloss. And that’s just how a movie about child molestation in the church should be – completely gloss-less. Because of its newsroom theme, Spotlight is going to draw comparisons to two other movies, both of which coincidentally star Robert Redford. First, the tireless and painstaking work on the part of the reporters gives Spotlight a feel that is not unlike that of All the President’s Men, the 1976 movie about the Washington Post’s breaking of the Watergate scandal. And, because it is being released just a couple of weeks after Truth, the dramatization of the “60 Minutes” expose of Bush’s National Guard service, Spotlight will undoubtedly get lumped in with that. Spotlight may not exactly be All the President’s Men, but it’s a hell of a lot better than Truth. The acting in Spotlight is all very good, but with the exception of Liev Schreiber, none of the actors really seem to be stretching it all that far. Rachel McAdams is as close to her comfort zone as she can get without being stuck in a romantic comedy. Michael Keaton and Mark Ruffalo are both at the top of their respective games as well, but they both seem to be just playing extensions of themselves. Schreiber is chameleonic in his role as editor Marty Baron, both physically and mannerism-wise; his skinny wimp demeanor is a far cry from the beefy thug that audiences have come to love and expect from him, but he pulls it off with style and grace. The cast is rounded out by John Slattery (“Mad Men”), who plays another managing editor at the paper, and by Stanley Tucci (The Hunger Games) and Billy Crudup (Almost Famous), both of whom play lawyers who represented past victims, and they’re all great as well. There’s no weak link to the cast of Spotlight, but Liev Schreiber deserves the most credit for taking a risk and breaking out of his own character mold.